Historically, the Earth has only seen one being who claimed he was "alien". Fact is, he claimed he was the Son of God. Frank Miller has said after DK2 he will pursue his ambition to retell the story of Jesus. What a story that will be since in DK2, it is clear Miller thinks anyone [alien or human] with such power should use that power to bash the bad guys, not be sacrificial lambs for the slaughter. Or be hung on a cross. In this final part, Batman gets his show on the road. He wants to finally rid America of the evil Lex Luthor and his alien ally, Brainiac. Using the invasive media, he calls the people to revolt against authority. On primetime, Batman urges the masses, "Were here to end the reign of criminals". By creating numerous pockets of street dissent, Batman distracts his opponents while putting the just-released Justice League into position. "Lets get this much straight, Clark. From here on out, we dont debate a damn thing. We dont discuss a damn thing. You tell me what I want to know and you do what I tell you to do." Batman yells it out: "From here on out, YOU WORK FOR ME." With two "Gods" on his side, Luthors machines of destruction are easily overcomed. An infiltration of Brainiacs sanctum by Supermans daughter, The Atom and the super citizens of the bottle city of Kandor, short-circuits that monster-machine. The heroes are victorious. Superman and Lara, up in the spaceways, look down on the Earth and for the first time, the alien with god-like powers asks, "What exactly shall we do with OUR planet, Lara?" This is the victory of Barabas, in the Bible the rabble rouser, the guerrilla leader who tried to oust the Roman invaders by force of arms only to be gently rebuked by the Son of God. This time Batmans anger, like Barabas, pushes the argument the other way. That a man of power should not "turn his cheek and look the other way". He must use it to utterly destroy evil. Miller took a very long delay finishing this final part. The first two were written and drawn prior to Sept 11. No official reason [at least I havent read any] has been given for Part 3s delay but you can make a guess that Sept 11 must have hung heavy on Millers mind. Did he change the way the story was heading? Or did it just become that much more angry, bloodthirsty and violent? The first couple of pages seem to evoke Sept 11. Wonder Woman and Captain Marvel in battle-scarred Metropolis. Neither having the strength left to carry on. Marvel goes first. The decapitation of Metropolis is like a memorial to New York. Theres a touching fly-past by Superman and Lara over the silhouette of a fireman. Miller also shows the masses as mindless and slavish followers of whatevers fashionable. In effect saying they are so easy to manipulate. He cleverly draws half a dozen tiny boxes representing the small voice of public opinion always echoing whatever the "expert" on television says. They are drawn here and there throughout the interludes when "talking heads" carry on the plot. As for the violence, many fans have commented on how "ugly" the art is this time around. How distorted, unreal and expressionistic the lines are. And how the colors jump garishly from scheme to crazy scheme across a few pages. 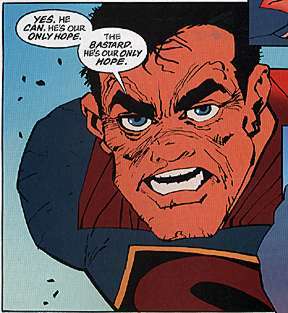 And how Millers pencils and inks make some heroes look downright cartoony. Well, DK2 certainly isnt in the Image Comics mould of muscular, hair-always-in-place superheroes. When Batman gets a severe beating by Luthor, his eyes and lips bulge with pain. Blood flows, bruises appear. 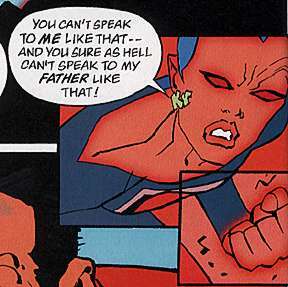 Well, thats what happens when youre dealing with aging superheroes, Supermans alien muscularity excepted. Theyve got to look less than perfect. Isnt it a tickle to see The Flash/Barry Allen with a pair of spectacles balanced on the bridge of his nose? Much better to see my heroes as they should be than an airbrushed picture of an aging rock star going on 70 but forever 39. The unexpected discovery in DK2 Part 3 is the unmasking of the "Joker" first seen in Part 2. Its a jealous Robin. Batmans wrath is withering. "You were pathetic, Dickster. You were ALWAYS pathetic. Youre STILL pathetic. And now youre pathetic AND just plain WEIRD-LOOKING." 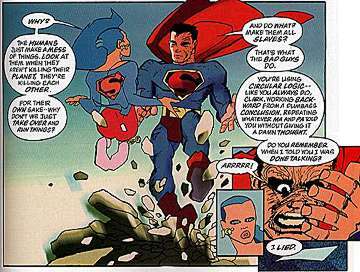 Miller has never liked the notion of superheroes with "boy" sidekicks. Its either homophobic of pedophilic. And your guess is as good as any when you hear the Dickster cry, "I LOVED you!" Eeeeyeww. Lets face it, what could a driven loner like the Batman ever want with a sidekick in shortpants with a green and yellow outfit and a name like "Robin"? Strike terror in your heart? Cmon. Miller even gets the characterisation right when Batman silently acknowledges his love for the "new" Robin aka Carrie Kelley. The whole Batcave is gone. When Kelley says its Batmans history thats been destroyed, he doesnt mind. "Souvenirs, darling. Nothing but souvenirs," he says. "I was sentimental  back when I was old." There can be no place for sentiment in Millers Dark Knight. Who you root for in this comic  Batmans tough-minded, control-freak tenacity or Supermans undermined nobility  depends on how you view life. The pantheon of heroes and especially superheroes require your belief that there must be a corresponding evil in the world that requires a superhuman effort to rid. Which brings us to the present dilemma that Miller and the world witnessed on Sept 11. When terrorists attacked America, Americans invaded Afghanistan to strike back at the heart of terror. But it didnt stop there. The "war on terrorism" is continuing into Asia and theres now talk of a second Gulf War. Someone forgot to tell the hawks that people die in wars. Victims have sons and daughters, mothers and fathers, brothers and sisters. A whole family tree can wither and die. If Miller cant understand why a Superman can stand back from ruling the planet, he also wont understand why anyone claiming to be the Son of God would die on a cross, murdered by insects he could incinerate with a thought.